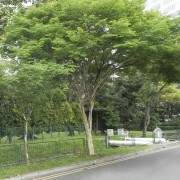 A tree is a perennial woody plant. It is most often defined as a woody plant that has many secondary branches supported clear of the ground on a single main stem or trunk with clear apical dominance. A minimum height specification at maturity varies from 3 m to 6 m and a minimum of 10 cm trunk diameter (30 cm girth). (Woody plants that do not meet these definitions by having multiple stems and/or small size are called shrubs). Compared with most other plants, trees are long-lived, some reaching several thousand years old and growing to up to 115 m high.